Windows Hot Keys allow computer users to conduct specific Windows operating system (OS) functions without having to navigate to application menus, which saves time. 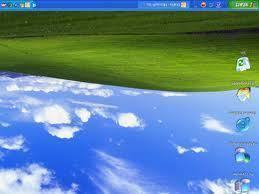 A common task that can be accomplished through Window Hot Keys is flipping a computer screen upside down. The resulting display can also be reversed with a similar method or by using applications found in the Windows Control Panel. Step 1 – Press the “Ctrl” + “Alt” + “Down Arrow” keys simultaneously. The computer screen will temporarily darken and then invert 180 degrees. Step 2 – Reverse the screen inversion by pressing the “Ctrl” + “Alt” + “Up Arrow” keys simultaneously. These hot key combinations work on Windows XP, Vista, and Windows 7. Step 2 – Choose the “Appearance and Themes” link located underneath the “Pick a category” display section. Step 3 – Choose the “Display” menu link and then click the “Settings” menu tab on the “Display Properties” window subsequently displayed. Step 4 – Click the “Advanced” menu tab and choose the “Driver” menu tab. Step 5 – Select the “Graphics Properties” menu option on the “Driver” menu tab. Step 7 – Select the number of degrees to rotate the screen, 180 will invert the computer screen. Step 8 – Choose the “Apply” menu button to rotate the screen. Press “Ok” on the subsequently displayed pop-up window to keep the new settings. If the “Ok” button is not pressed after several seconds, the display will switch back to the previous view. everything was solved. Try this software and you would be glad you did. Hi, I’m having a problem with my USB mouse: It keeps disconnecting and then I have to pull it out and reconnect it. Sometimes if I’m lucky, It works but when I’m not, it will take a couple frustrating tries, bangs, and a blow of air in the plug to work. I tried downloading the drivers but when I looked it up, I couldn’t find the right one. By the way, the mouse is a Dell mouse. And in case you can provide me with a link for a driver that corresponds with my computer’s model, my computer’s service tag is: H21WLB1 . 324 queries in 0.341 seconds.